As discussed in the Train Layout Design page, one way to develop your own model railroad track planning in to use layout design elements based on prototype track plans. How do you find out what those track plans are? ~ You could look at an atlas, or map, of the railroad published in books, which is actually still a great thing to do in order to really see the overall layout of the railroad, which towns it services, etc. ~ You could join the appropriate historical railroad society (See Resources Page), which can give you not only maps of the railroad but also a lot of the history and other information about it as well - e.g., industries, people, operations, etc. 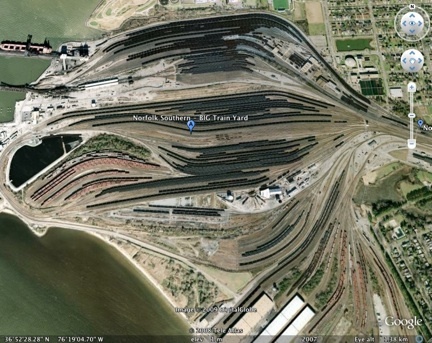 ~ And, you could use Google Earth (http://earth.google.com) to help you find rather detailed satellite photos of actual prototype tracks that you could use as train layout design elements to build your own model railroad track plans. This is very easy to do. Just go to the earth.google.com website and download the free software. Then click on the application icon. When the program opens, you will see a search box on the left side of the screen. Enter one of the cities where the prototype railroad runs through. Then, under the business heading, type in the name of the railroad. Google will then provide the satellite photo map for you with the points you are looking for. Move the photo around using the tools provided and zoom in to get a close up of the track design. 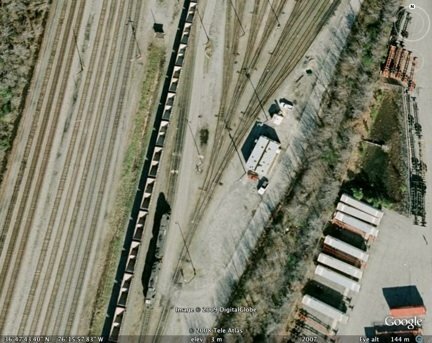 Follow some of the tracks away from the yard as well, though they sometimes get hidden within the trees. If you type in certain industries under the business heading, you may also be able to see how the tracks are laid out in relation to those industries. If you want to take a picture of the map for your own future reference, click on the little envelope at the top of the map, then enter your own email address. Within seconds, you will get a picture of the Google satellite photo in your email that you can then save for future reference. The pictures on this page were obtained exactly as described above. As you can see, some of the prototype train yards are quite large and complicated. You most likely would not want to try to replicate one of these areas exactly, but just get general ideas about how the tracks come together in the yard so that you can build something like it on your layout on a much smaller scale. This is probably most helpful in learning the details of train yards, turntables, and how the tracks are located with respect to certain industries. It would be less helpful in learning the overall layout of the track between cities and across the country, and of course doesn't really give any information about history or operation except what you might be able to surmise from looking at how the tracks are laid out. However, it is one more interesting piece of information that may be helpful to you as you plan your own model railroad. 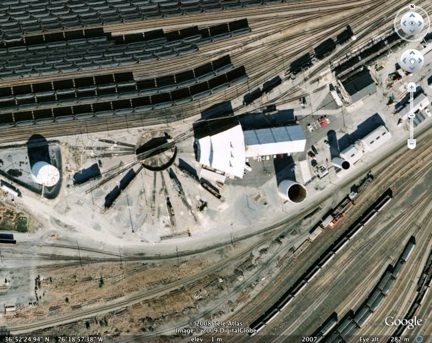 From "Google Earth" to "Train Layout Design"
From "Google Earth" to "HomePage"